Lodge Cottage01263 821445work01263 821445fax Guest AccommodationBuilt in the mid 19th century, Lodge Cottage is a delightful property built of brick and traditional knapped flint. It has been lovingly refurbished and is now the ideal location for the relaxing luxurious break you're looking for. Personal service and close attention to detail are keynotes to our success to date. The emphasis is on offering our guests a warm welcome and relaxing, comfortable stay in quality accommodation. We want you to feel at home. We have five bedrooms all beautifully appointed and lovingly cared for and well equipped. We offer double or twin rooms. The bathrooms are equipped with electric power showers, soft, large white towels and complimentary toiletries. Two rooms also have full size baths in addition to showers. There is a light, comfortable breakfast room and a lounge with sofas and a desk top computer for the exclusive use of guests. All rooms have free broadband Wi-Fi internet. We are able to offer ample off road parking. We are situated on the edge of the National Trust's Sheringham Park in the beautiful quiet village of Upper Sheringham, designated an Area of Outstanding Natural Beauty and ideally placed to explore the stately homes, villages, countryside and coastline of this unspoilt area of north Norfolk. 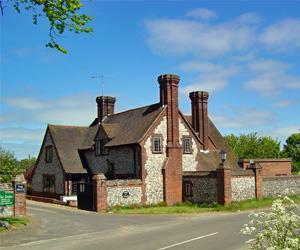 Built in the mid 19th century, Lodge Cottage is a delightful property built of brick and traditional knapped flint. It has been lovingly refurbished and is now the ideal location for the relaxing luxurious break you're looking for. Within a short walk is a hotel restaurant and bar offering lunches, afternoon teas and evening meals. There is a large choice of pubs, restaurants and tea rooms within a short drive. From the A148 (Holt-Cromer Road), take the B1157 signposted Sheringham Park and Upper Sheringham. Follow the road down the hill. Lodge Cottage is the first house in the village on the left hand side sharing the driveway with the Dales Hotel. Sheringham is at the end of the One Bittern Line from Norwich. Taxis/buses are available from Sheringham Station.